Giving corporations the inalienable right to buy elections. We live in what will surely come to be called the Citizens United era, a period in which a runaway corporatist ideology has overtaken Supreme Court jurisprudence. No longer content just to pick a president, as five conservative Republicans on the Rehnquist Court did in 2000, five conservative Republicans on the Roberts Court a decade later voted to tilt the nation’s entire political process toward the views of moneyed corporate power. 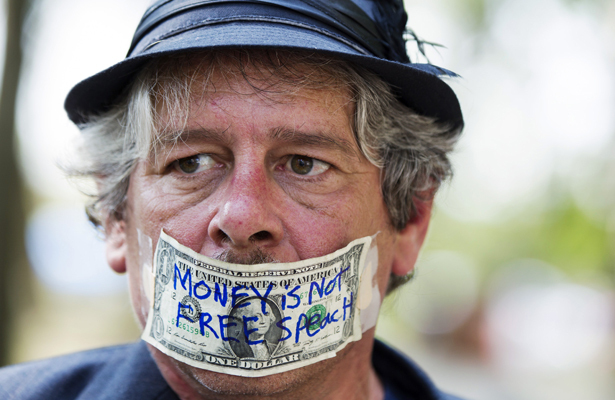 In Citizens United (2010), the Court held that private corporations, which are nowhere mentioned in the Constitution and are not political membership organizations, enjoy the same political free speech rights as people under the First Amendment and may draw on the wealth of their treasuries to spend unlimited sums promoting or disparaging candidates for public office. The billions of dollars thus turned loose for campaign purposes at the direction of corporate managers not only can be but—under the terms of corporate law—must be spent to increase profits. If businesses choose to exercise their newly minted political “money speech” rights, they must work to install officials who will act as corporate tools. Before Citizens United came down, corporations were already spending billions of dollars lobbying, running “issue ads,” launching political action committees and soliciting PAC contributions. Moreover, CEOs, top executives and board directors—the people whose income and wealth have soared over the past several decades in relation to the rest of America—have always contributed robustly to candidates. But there was one crucial thing that CEOs could not do before Citizens United: reach into their corporate treasuries to bankroll campaigns promoting or opposing the election of candidates for Congress or president. This prohibition essentially established a wall of separation—not especially thick or tall, but a wall nonetheless—between corporate treasury wealth and campaigns for federal office. The Bellotti decision cracked open the door of campaign finance law, and the Citizens United majority blew that door off its hinges. The Court announced that, when it comes to campaign spending rights, the “identity of the speaker” is irrelevant and an impermissible basis upon which to repress the flow of money speech. What matters is the “speech” itself, never the speaker—a doctrine that would have come in handy for the public employees, public school students, whistleblowers, prisoners and minor-party candidates whose free-speech rights have been crushed by the conservative Court because of their identity as (disfavored) speakers. Taken seriously, the Citizens United doctrine has astonishing implications for campaign finance. If it’s true that the “identity of the speaker” is irrelevant, the City of New York—a municipal corporation, after all—should have a right to spend money telling residents for whom to vote in mayoral races. Maryland could spend tax dollars urging citizens to vote for marriage equality in November, and President Obama could order the Government Printing Office to produce a book advocating his re-election. Surely the Supreme Court would never ban a book containing campaign speech! religious corporations—would have a First Amendment right not only to promote candidates from the pulpit but to spend freely on television ads advocating their election or trashing their opponents. The claim that churches surrender their right to engage in electioneering when they accept 501(c)(3) status is obsolete after Citizens United, which rejected the view that groups can be divested of their right to participate in politics when they receive incorporated status and special legal and financial privileges. If the identity of the speaker is truly irrelevant, there should be nothing to stop the Church of Latter-Day Saints or Harvard University from bankrolling political campaigns. In the real world, the claim that the identity of the speaker is irrelevant cannot be taken seriously, and it is already being disregarded by the justices who signed on to it. The Court has so far declined to strike down the ban on foreign spending in American politics and the century-old ban on direct corporate contributions to candidates, laws that the new doctrine logically should invalidate. A total wipeout of campaign finance law appears to be just a step too far—at least right now—for a Court already facing plummeting public legitimacy. But even if this incoherent doctrine goes no further, the surging stream of corporate and billionaire spending has already made a sweet difference for the Republican Party, which despairs of the nation’s demographic and cultural changes and depends on a mix of right-wing propaganda and voter suppression to confuse and shrink the electorate. Indeed, the potency of Citizens United became clear in the same year the decision was released. The 2010 election should have been framed by three recent corporate catastrophes: the BP oil spill in the Gulf of Mexico, which inflicted billions of dollars in damage; Massey Energy’s collapsing coal mines in West Virginia, which cost twenty-nine people their lives and were enabled by the corporation’s aggressive lobbying and corruption of government; and the subprime mortgage meltdown brought on by the misconduct and power plays of AIG and Wall Street, which cost the American people trillions of dollars in lost homes and home values, ravaged pension and retirement funds, and destroyed stock equity. But the infusion into the campaign of hundreds of millions of dollars from corporate and personal sources through secretive 501(c)(4) advocacy groups, 501(c)(6) trade associations and eighty-three new Super PACs completely changed the subject. The theme of the propaganda-soaked campaign became, remarkably, the urgent importance of deregulating corporations. The Republicans and the Koch brothers–funded Tea Party captured control of the House, bringing near paralysis to the government. Citizens United did not accomplish this feat alone; it had a junior partner in SpeechNow.org v. FEC. This decision came from the US Court of Appeals for the DC Circuit, which struck down limits on what individuals can give to independent expenditure campaigns, a ruling that turbo-charged the Super PACs. While Citizens United freed the corporations, SpeechNow.org emancipated billionaires like Sheldon Adelson, the casino king who bets large on right-wing causes. Adelson’s millions kept the floundering Newt Gingrich afloat for the Dixie primaries. After Gingrich’s campaign went craps, Adelson sent $10 million to a pro-Romney Super PAC and vowed to spend as much as $100 million to defeat Obama as president. Today there are 844 Super PACs and countless 501(c) vehicles; experts say billions of dollars, much of it untraceable, will flood the 2012 election. We will never know for sure whose money is paying for the show, because the front groups easily conceal their donors, including foreign corporations. Moreover, right-wing lawyers are now challenging campaign finance disclosure requirements as unconstitutional compelled speech, like making Jehovah’s Witness schoolchildren pledge allegiance to the flag. They argue that corporations should be free to keep their political spending secret because they may face intimidation and even—God forbid—boycotts from consumers who dislike their politics. In other words, corporations have a right to speak because they are like people, but they should be completely insulated from the speech reactions of natural people. This is some “marketplace of ideas” the champions of corporate power have in mind for us. Support for a constitutional amendment to reverse Citizens United is growing because, as Justice Stevens objected, ”A democracy cannot function effectively when its constituent members believe laws are being bought and sold.” An amendment to allow for reasonable regulation of campaign expenditures and contributions would empower Congress to return corporations to the economic sphere. It would also solidify the public’s interest in campaign disclosure and, as Harvard professor Laurence Tribe has observed, the much-eroded interest in building a public financing system that makes participating candidates at least minimally competitive with privately financed candidates. This is an interest that the Roberts Court has trashed, in cases like Davis v. FEC (2008) and Arizona Free Enterprise Club’s Freedom Club PAC v. Bennett (2011). In these decisions, the Court, in essence, ruled that privately financed candidates backed by wealthy interests not only have a right to spend to the heavens to win office but also a right, in states with public financing laws, to lock in their massive financial advantage over publicly financed candidates, whose campaign speech may not be even modestly amplified by public funding when they get outspent. Here, as distorted beyond recognition by the Roberts Court, the First Amendment becomes not the guardian of democratic discussion but the guarantee of unequal protection for well-born and wealth-backed politicians. Today, corporations can saturate the airwaves and billionaires can spend to their hearts’ content, but government cannot create even a modest megaphone to help poorer candidates be heard. A constitutional amendment to correct these distortions may seem impossible now, but all amendments seem impossible until they become inevitable. Most amendments since the Bill of Rights have expanded democracy or, like the Twenty-Fourth Amendment banning poll taxes, removed obstacles to democracy authorized by the Supreme Court. President Obama’s recent statement of support for mobilizing a campaign to amend the Constitution suggests a coming surge of political engagement on the issue. Defenders of our new plutocracy point out that there are many thousands of corporations in America, most of them small, but this bit of faux small-business populism is an irrelevant distraction from how the corporate “wealth primary” works in the real world. Major industries that have an “extractive” character and a parasitic relationship with government—Wall Street, Big Oil, Big Pharma, the military-industrial complex—have cultivated a pervasive financial dependency on elected officials that permits them to continue the exploitative symbiosis that economists call “rent-seeking.” Avoiding the hazardous risks of innovation, investment and competition, many conglomerates prefer playing power politics in Washington. They don’t increase the pie; they just grab ever larger slices of it. These arrangements operate on a simple return-on-investment basis: corporations devote millions to electing and lobbying politicians and then collect hundreds of millions in tax breaks, corporate welfare, sweetheart contracts, bailouts, deregulation and inside deals. This squalid form of “public policy,” which even Republicans call “crony capitalism” (in the primaries anyway), works splendidly for those involved but dismally for everyone else, including businesses that lack the finance capital to invest in the political system. A plutocratic state denies us both political justice and a fair economy. When a bristling Justice Antonin Scalia went on CNN in July and defended Citizens United, which is considered a recipe for corruption by nearly 70 percent of Americans, he enlisted everyone’s favorite founder. “I think Thomas Jefferson would have said, ‘The more speech, the better,’” Scalia opined.